Click here to download this briefing paper as a pdf file. The online version links to references. For IBFAN’s briefing on FTSE4Good – click here. Nestlé is listed in the FTSE4Good ethical investment Index. Nestlé’s Chairman tells people this demonstrates it complies with baby food marketing requirements. This is not the case. FTSE has asked Nestlé more than once to stop misrepresenting what inclusion signifies. Here is the background. FTSE introduced new Breastmilk Substitutes (BMS) criteria for including companies in its FTSE4Good Index in September 2010. Under these criteria a company does not have to comply with the international minimum marketing standards to be included. This allowed Nestlé to be added to the Index in March 2011 even though it continues to systematically violate the International Code of Marketing of Breastmilk Substitutes and subsequent, relevant Resolutions of the World Health Assembly (the Code and Resolutions). 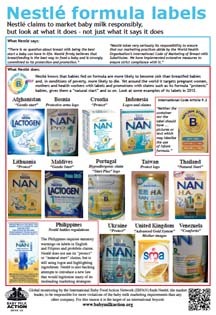 For example, Nestlé promotes its formula with claims such as it is the ‘natural start’, a ‘gentle start’ and ‘protects’ (download Baby Milk Action’s poster showing labels from Thailand, Afghanistan, Maldives and other countries). Despite Nestlé’s claims, babies fed on formula are more likely to become sick than breastfed babies and, in conditions of poverty, more likely to die. Despite FTSE’s difficulties, Milk Action is in ongoing communication with Nestlé and other companies. Unlike FTSE, we have prompted changes to marketing practices – through public campaigns. For example, Nestlé stopped claiming its formula is ‘The new “Gold Standard” in infant nutrition’ after thousands of supporters emailed the company. Save the Children’s 2013 Superfood for Babies report in defence of breastfeeding documents Nestlé violations in China, India, Laos and Pakistan. For example, ‘Our recent survey in Pakistan reported that one-fifth of health professionals surveyed said they had received gifts from representatives of BMS companies…. Over half of these gifts were reported to have been Nestlé-branded’. To encourage companies to improve their policies, practices and accountability, FTSE4Good should, by 2015, extend its criteria for the inclusion of a BMS company on its index to include the company’s activities in all countries, rather than just those countries listed as higher risk, and should bring its criteria into line with the International Code and resolutions. It should assess company practices in selected countries against the Code and resolutions, as well as the company’s own policies. FTSE agrees with Baby Milk Action that Mr Brabeck’s comments are inaccurate. FTSE has had to ask Nestlé more than once not to suggest that inclusion signifies compliance with the WHO code. This was not the first time that FTSE had weakened its criteria. Save the Children’s 2006 report A Generation On: Baby milk marketing still putting children’s lives at risk states: ‘In 2003, the ethical investment index FTSE4Good developed criteria to determine whether or not baby food companies should be included in the index. Before then, all baby food manufacturers were automatically excluded from the index because of evidence of Code violations. In order to qualify for entry on the FTSE4Good index [now], baby milk companies do not have to demonstrate full Code compliance, only that they have put management systems in place to reach, eventually, Code compliance.’ The report includes a table naming the companies that are ‘engaging in negotiations with FTSE’. So FTSE began by requiring companies to abide by the Code and Resolutions to be listed, the normal approach taken by the Socially Responsible Investment (SRI). As companies have continued to violate the Code, FTSE has changed the rules to try to allow half the sector onto its list. Note 2: At least two organisations with substantial investments in Nestlé are amongst those providing advice to FTSE on the listing and assessment processes. This constitutes an unacceptable conflict of interest. One of the investors is the Central Finance Board (CFB) of the Methodist Church, which controversially invested over £1 million in Nestlé in 2007. For full details of events before and after the investment, with reference to source documents, see Baby Milk Action’s archive site – click here. The CFB and the Joint Advisory Committee on the Ethics in Investment (JACEI) have since attempted to justify investing in Nestlé in reports that praise Nestlé executives for meeting with them. Yet, ethical investment organisations that refuse to invest in companies that violate the Code and Resolutions also meet with executives. Even a £1 million shareholding does not hold sway with executives who ignored a rebellion by 36% of shareholders to make their Chief Executive also Chairman in contravention of good corporate governance practices in 2005. JACEI reported that Nestlé was added to the FTSE4Good Index, but did not indicate this was because FTSE had changed the criteria to allow companies that routinely violate the Code to be included. Note 3: The inclusion of Nestlé in the FTSE4Good Index is causing confusion, being exploited by Nestlé and undermining methods that do hold the company to account. 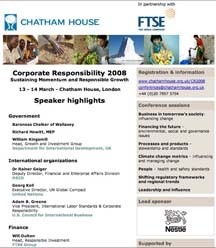 The FTSE4Good criteria were weakened after this resolution, allowing Nestlé to be added to the Index in March 2011. The URC Mission Committee (which represents Church and Society issues) did not take the matter back to the Assembly as it said it was obligated to act on the Resolution, resulting in it ‘issuing an instruction to its Mission Council meeting to terminate the boycott of Nestle products.’ The Mission Council serves as the executive of the URC between General Assemblies and meets biannually. Note 4: The boycott has been instrumental in forcing changes on Nestlé, because it puts a financial cost on malpractice. With sufficient publicity and public support, campaign action forces changes. A few examples: Nestlé agreed to translate its formula labels when Mark Thomas picked up on Baby Milk Action’s campaign for his television programme (watch here). A 9-year campaign saw Nestlé change on its policy on the labelling of complementary foods, making the announcement during a week of demonstrations in the UK, filmed by Swiss TV in 2003. Just last year, Nestlé said it had discontinued a leaflet claiming its formula is ‘The new “Gold Standard” in infant nutrition’ after receiving emails from thousands of boycott supporters. But other violations continue and Nestlé said it would only act on 4 of the 130 violations it counted in the Breaking the Rules report – that’s just 3% and included the leaflet targeted in the email campaign (Danone, which is also a significant source of violations, said it had already taken action to stop 50% of violations in its profile and agreed to further action on other issues highlighted). Click here to download Baby Milk Action’s briefing paper.